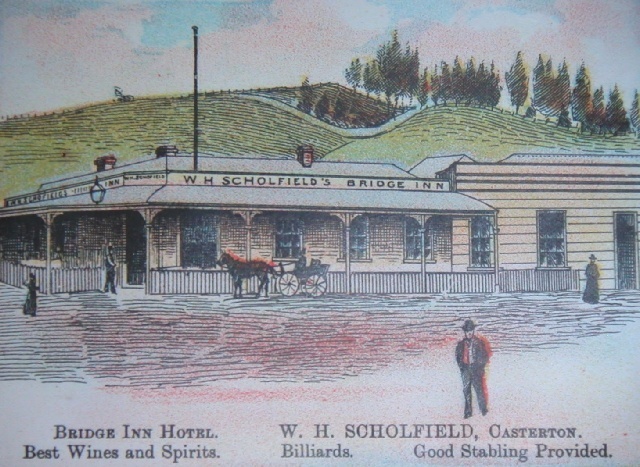 The "Bridge Inn" at Casterton was the only hotel situated on the east bank of the Glenelg River. It was established by James SEYMOUR (1831-1884) in 1876 and then operated by his widow Bridget after his death in 1884. James DOYLE (1829-1898) took over the licence and his son John DOYLE (1854- ? ) was the publican. William SCHOLFIELD became publican in 1890 and then his widow Agnes (nee BENSON) took over after his death in 1896. The building was eventually demolished about 1919. The "Bridge Inn" was taken over by John MULCAHY from 1902 to 1905. John had been a storekeeper at Sandford in the early 1880s and an inkeeper at Mount Gambier before taking this lease on the :Bridge Inn" in 1902. William Hall SCHOLFIELD b. 1844, Lancashire, England, son of Samuel SCHOLFIELD and Alice May HALL was married to Agnes BENSON, b. 1850, Cumberland, England, daughter of John BENSON and Jane TAIT.